To receive direct referrals and to advertise your agency directly to the medical industry.. 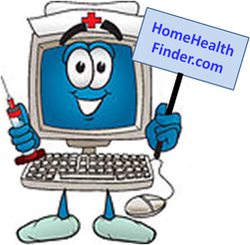 It's always free to sign-up and promote your Home Health Care agency on HomeHealthFinder.com website. All patient referrals will be sent directly to your e-mail and or via phone call. There is a small cost of $13.33 per month ($160.00 annually). ​medical professionals for patient referrals in 2018 & 2019.